When you're taking photographs of a product that you want to sell online or promote on social media, you want to make sure that it looks picture perfect! The right lighting and backdrop make all the difference between a professional photograph that impresses customers and one that looks amateurish. Fortunately, you don't have to spend time studying the light and setting up complicated scenery. The TWONE Folding Portable Lightbox Studio will give you the perfect setting for your photos in seconds! The TWONE Folding Portable Lightbox Studio is a revolutionary mini photo studio that folds up to the size of an A4 sheet of paper. You can carry it right inside of your gear bag and take it with you anywhere. When it comes time to take a photograph, unfold the cube, and you'll have a large enough space to take a photograph of an item up to 8.9 inches by 9 inches by 9.5 inches in size. We engineered the TWONE Folding Portable Lightbox Studio to give you the absolute best setting for any photograph. Energy efficient LEDs provide optimal illumination that allows the colors and details of objects to be easily seen. The frosted surface of the box allows for soft light diffusion to ensure that items look their best with every shot! Unlike other portable light boxes, the TWONE Folding Portable Lightbox Studio gives you the flexibility to choose your preferred power supply. Use the included 5-volt battery or a mobile power supply of your choosing. You can also connect it to a cell phone charger. No matter how you use the light box, you can count on it to last through many, many photoshoots because it's made from waterproof, anti-wrinkle, tear-resistant materials. Take better photos with your DSLR or smartphone and show off products as you never have before! 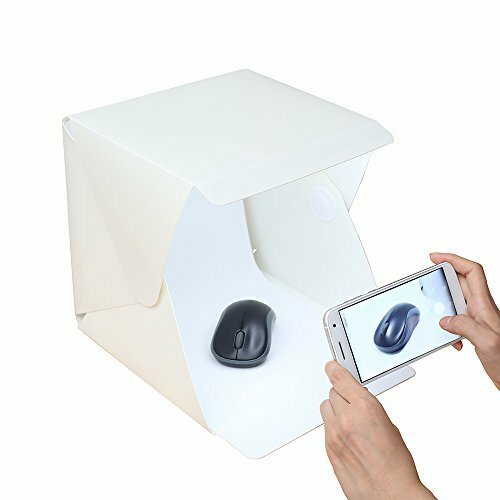 Order the TWONE Folding Portable Lightbox Studio now. SO EASY TO CARRY No bigger than a piece of paper when it's folded! Built-in magnet for quick setup, collapsible design, Space-saving and resist compression. IDEAL BACKDROP FOR SO MANY ITEMS Opens into a cube that can hold an item up to 8.9 inches by 9 inches by 9.5 inches in size. Creative Design with 6500K LED lights, Provides additional lighting during photography sessions, Micro USB port for Convenient power supply. The structural material is a hard polypropylene material with a matte-finished surface, Durable Yet Lightweight. Waterproof, Anti-flaming; keep clean and neat by wet cloth to wipe it directly. Resist compression. Black and white 2 colors background backdrops and Micro USB cable included (power bank NOT included), skid resistance with Hooks fixed. Non reflective, focusing your photography and Earning more professional and more beautiful pictures. If you have any questions about this product by TWONE, contact us by completing and submitting the form below. If you are looking for a specif part number, please include it with your message.